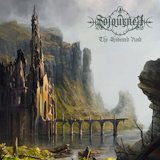 For those who were pleasantly surprised by Sojourner's debut, Empires of Ash, The Shadowed Road returns with most of the same elements: Skirling flutes and lush atmospheric soundtracks paired with black metal and female vocal duets. What made Sojourner pull ahead of a very crowded pack from the get-go was the intricacy of their arrangements, and we get to see these already-considerable skills advanced further on the group's sophomore release. This time, there is more of Chloe Bray's light and ethereal vocal work than before. Her voice plays well against Emilio Crespo's blackened croaks, but even though they're arranged more like a duet, they're light enough to pass for background vocals a lot of the time. A Winter's Slumber isn't a bad start to the album, all wispy oohs and ahhs from Chloe mixed with liberal application of the tin whistle, but I liked the darker and heavier Titan better; a more traditional post-black tune with the Sojourner folk treatment added on, its switch between a Celtic folk beat and black metal blasting is quite impressive to hear. Again, the epic soundtrack arrangements, all the more impressive for being made in an Internet collaboration between Sweden and New Zealand, are the high point of listening to The Shadowed Road -- except they've gotten even better. Everything's crystal clear in production and beautifully done, with the black metal tremolo picking on Our Bones Among the Ruins woven so skillfully into the overall songs that it fades into the background when listened to as a whole, but like its predecessor, this is no mere post-metal hint at darkness or heaviness before the musicians turn back to their MIDI patches, but a solid atmospheric black metal album supported by the guitars in every way just below the surface. Nor, though the tin whistle plays a large part in the recognizability of the Sojourner sound, is the album heavily folk-influenced; one might just as easily say it's Summoning-influenced (it is). The band's got a little bit of everything now, even to the point of potentially appealing to non-metal listeners (maybe minus the black metal vocals), and the result is beautiful.